The Iron Men from Auburn. An 83-year-old, 7-7 tie with Wisconsin does not the stuff of legend make. The previous sentence was a lie. The final 1 in Auburn’s current 1-1-1 record vs. the Badgers was instantly the stuff of legend, and a completely underrated (and barely even remembered) chapter in Auburn’s big game history. 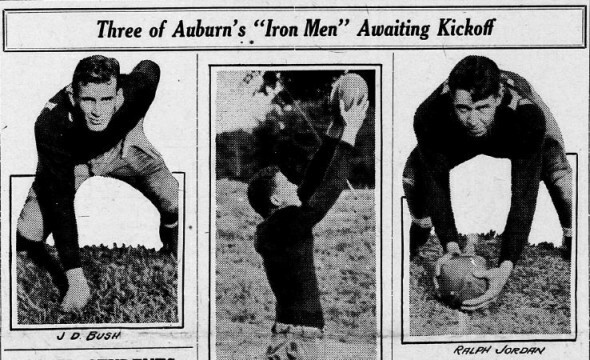 Chances are you’ve never heard about it, but leading up to the 1931 season it was all anyone in Auburn was talking about. For starters, it was Auburn’s first real intersectional game in five years—or eight years, depending on who was writing. 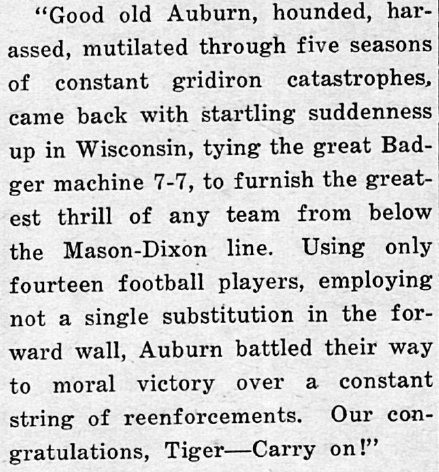 Half the people previewing the Wisconsin game seemed to have forgotten about Auburn’s 1926 game vs. Marquette (what with it being played in Auburn, and against, you know, Marquette). As far as some papers were concerned, Auburn’s last tangle with Yankees was the 1923 Army game at West Point. Why Wisconsin? 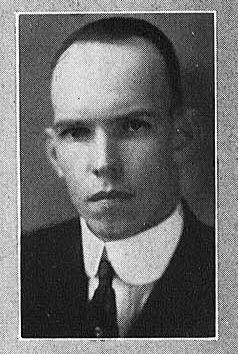 Maybe it had to do with this guy, A.D. Burke, a Wisconsin grad who since 1929 had served as the head of API’s Dairy Department. Auburn was originally scheduled to play Vanderbilt on Oct. 10. The well-proportioned Badgers were figuratively and literally throwing their weight around the mighty Midwest. 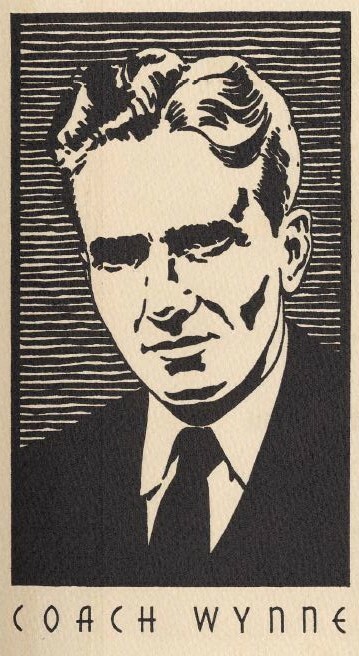 Now, sure, the 1931 squad’s 6-4 final record may not seem that impressive. But those four losses were close losses, and to perennial powerhouses. They had gone 6-1-1 the previous season, tying Ohio State, losing by one point to Purdue (back when you did not want to play Purdue), and by 13 to co-Big 10 champs Northwestern (which Wisconsin head coach Glenn F. Thistlethwaite had coached to a conference championship a few years earlier). 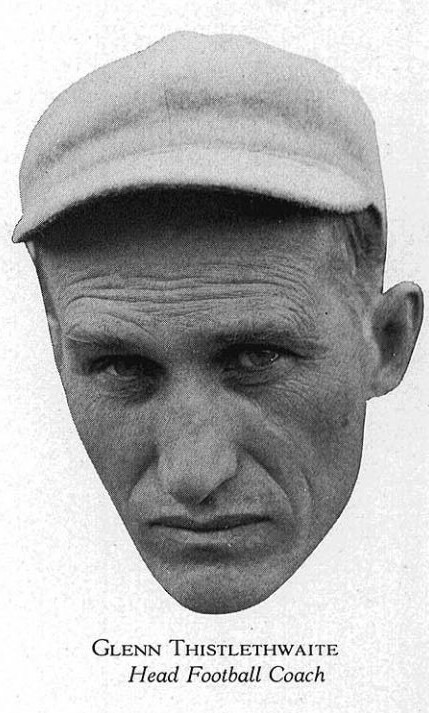 In 1928, they went 7-1-1. 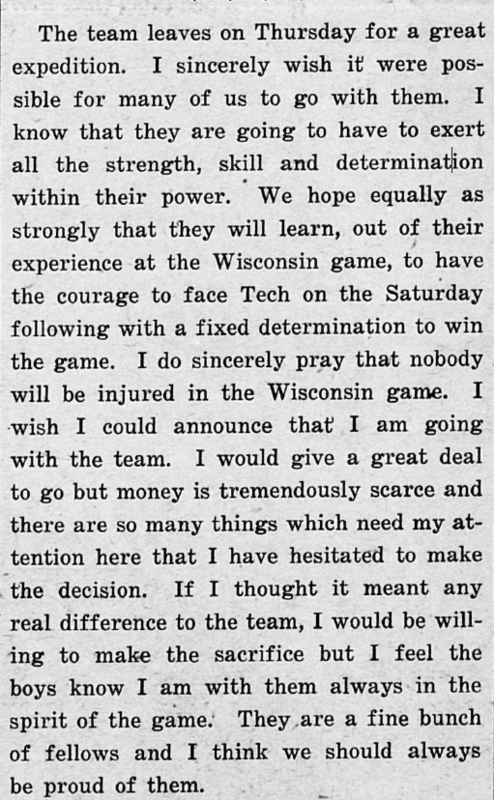 Minnesota kept them from claiming the Big 10 championship by a measly six points, but not before the Badgers took out Michigan, Chicago, Iowa, even Knute Rockne’s Notre Dame, which would win the national championship the following year. Oh, and Alabama. Yes, the mighty Crimson Tide had invaded Wisconsin three years earlier. It did not end well. The Badgers well-proportioned the hell out of them, 15-0. And what with it being a time when pure poundage was still one of the primary predictors of victory, on Oct. 10 they expected to do the same to Auburn. In fact, the word from Madison was that Wisconsin basically deemed it a glorified practice game, the icing on a cupcake trifecta: Bradley Polytechnic from Illinois, North Dakota State, and Alabama Polytechnic from some town called Auburn. In the end, 31 players made the trip up to Madison, including future All-American (Auburn’s first) Jimmy Hitchcock and senior starting center Ralph “Lefty” Jordan, all of them perfect gentlemen. 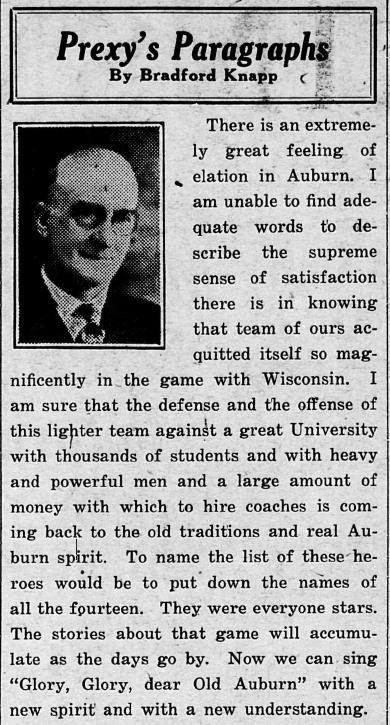 Yes, a railroad officials was so impressed by the social graces of the Auburn team as they wound their way toward certain defeat he was compelled to write Knapp a letter. Charles F. DeBardeleben, Birmingham coal baron and Auburn booster—his brother Henry played on Auburn’s first football team—also rode with the team, boarding the train in Birmingham, and was equally complimentary of the team’s behavior. With coaches and a few sports writers, the Dixie delegation totaled 38. They stopped in Chicago to see the sights. They got in some practice at Loyola. Then it was time. The game was cold, wet, bleak. And primitive. Three yards and a mist of mud. It rained the whole 60 minutes but the first half might as well have been played in a drought compared to the second. “Rain started to fall in sheets as the teams came out for the second half.” When the boring Plainsman play-by-play decides you need to know it was raining, then it was really, really raining. The field was sludge; Auburn didn’t budge. They went toe to toe with the Big Ten titans–and by “they” I mean just 14 players. Due to a lack of depth—the Tigers were pretty banged up—second-year coach Chet Wynne substituted just twice. Meanwhile the play by play shows Glenn F. Thistlethwaite substituting liberally, keeping his huskies fresh. Auburn’s line played the entire game. The whole game. And they never let Wisconsin cross the goal line, not from scrimmage at least. The Badger’s lone touchdown came on a 100-yard return on the second half’s opening kickoff. But the dude missed the extra point! And if Auburn hadn’t been offside, Auburn might lead the series 2-1. Because he made the second kick. And because a couple of drives later, after taking a timeout because Shug was injured (he fought through the pain like that time vs. Germany and stayed in), the Tigers took it in for a touchdown. Jimmy Hitchcock. Two yards. Jimmy kicked the extra point, too. Tie game. Final score: 7-7. Shug and the Iron Men from Auburn went on to handle Georgia Tech, 13-0. It was Auburn’s first win over the Yellow Jackets since 1919. People in Auburn only learned about the Iron Men after stupid game 7 of the World Series was over—that’s what WAPI went with instead of the Auburn-Wisconsin game. Sheer madness. An occasional summary of the action was read during the commercials, but the full play-by-play wasn’t broadcast until the Cardinals beat the A’s. But since the team wouldn’t be arriving (again, very courteously) back in town until Sunday night, there was plenty of time to prep the celebration. Those headlights stretched back eight whole miles. It was three thousand peoples worth of Ford Model A’s and whatever else people drove back then—that’s how many were waiting on the boys at the station. It was the biggest train-greeting crowd ever in Opelika, way bigger than the one former President Taft got a few years earlier. The word “frenzy” showed up a lot in the coverage of the celebration. The band played like wild. People screamed. They shouted “War Eagle!” Players got up and thanked everyone, at least that’s what people guess they were saying—it was too hard to hear. Even one of the sportswriters who road with the warriors up to Wisconsin got up to proclaim that what the Iron Men from Auburn did to the Badgers was one of the damnedest things he ever saw. That they had meant that “the old traditions and real Auburn spirit” were back. Photos: Auburn Glomerata, Wisconsin Badger, Auburn Plainsman. Related: Watch Auburn beat Wisconsin in the 2003 Music City Bowl.